He was an exemplary reformer, in the best American tradition. Birthing the new was always at the heart of Tom’s love of life. 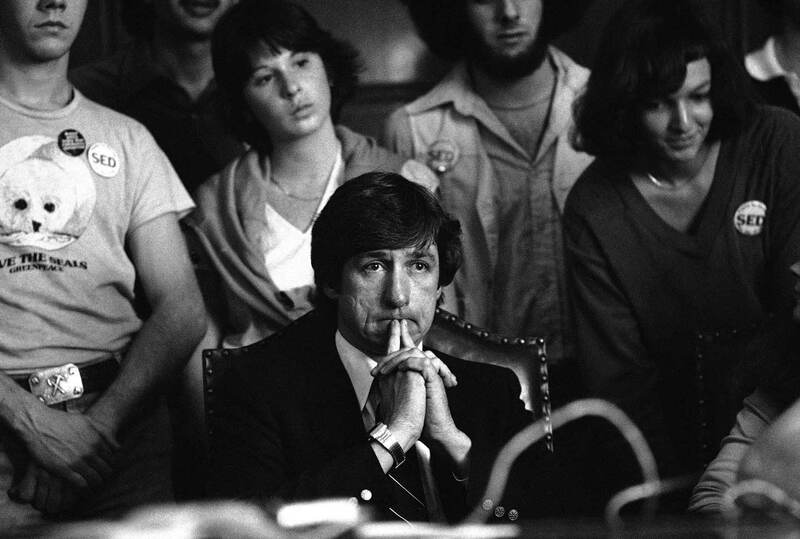 A week before he died, I went to say farewell to Tom Hayden. I’d known him ever since we met in Berkeley in 1969 during the tumult of People’s Park, when he was 29 and I was 16. I knew he was gravely ill, debilitated by the stroke he’d suffered the year before, just three weeks after he’d agreed to write a book I’d been urging him to undertake for Yale University Press. For the next 18 months, we would work closely together on a modest book-length essay about the legacy of the Vietnam protest movement. I had suggested he write it as a natural outgrowth of the conference he and other antiwar veterans had organized in Washington, DC, to protest the Pentagon’s plan to sanitize an official commemoration of America’s Vietnam veterans. That plan had conveniently omitted to mention those courageous vets who protested the war, the brave young men who resisted the draft, or the many millions of patriotic citizens who had come together in an unprecedented movement of opposition. Tom was appalled that our legacy of protest was in danger of being forgotten. As he wrote: “One can only guess why so many elites want to forget the Vietnam peace movement by history cleansing, why public memories have atrophied, and why there are few if any memorials to peace.” We talked about how efforts to end an unjust war had been whitewashed and stricken from mainstream memories, and what to do about it. He felt that “the steady denial of our impact, the persistent caricatures of who we really were, the constant questioning of our patriotism, the snide suggestions that we offered no alternative but surrender to the Communist threat have cast a pall of illegitimacy over our memory and had a chilling effect on many journalists, peace dissenters, and the current generation of students today. Of course, one reason for this forgetting is that the Vietnam War was lost, a historical fact that representatives of a self-proclaimed superpower can never acknowledge. Accepting defeat is simply not permissible.” We agreed that if truth is famously war’s first casualty, memory is its second. Tom’s book would be a necessary intervention in the on-going conflict between empire and democracy. Tom always did live in the unforgettable present moment, and he refused to be hostage to an easy, self-aggrandizing nostalgia for the “good old days” of the 1960s. As much as he had a profound respect for the ways that history, as was once so famously observed, weighs upon the brain of the living like a nightmare, he spent his life trying to write it by making it in the here and now. He never lost his capacity for outrage at the way things are. It kept him young. He was ever ardent with a deep faith in the capacity of people to change. His constant efforts over many decades to reach out to others, to build alliances, to combat injustice, overcome racism, and deepen democracy, are widely known. I loved Tom as much as I admired him. When I met him in that spring of 1969, he and a couple of comrades were taking a break from the exertions of resisting the violent police suppression of People’s Park to wander down to the campus of Berkeley High School, where I and several hundred other students had organized a “sleep-in,” refusing to leave the school grounds while the city was occupied by police and the National Guard. Because geography is fate and Berkeley had been a magnetic pole of rebellion, I enjoyed a precocious adolescence. I was familiar with the Port Huron Statement and was aware of Hayden’s antiwar activism, having read his account of his visit to North Vietnam, and followed his writings in various journals, including The Nation. I was enthralled by how Tom led our discussions…asking questions, prompting us to delve deeper and think more rigorously. That summer, as Tom prepared for his upcoming trial in Chicago to defend himself against charges that he’d organized violent riots to protest the Vietnam War at the 1968 Democratic National Convention, he agreed to conduct what amounted to a graduate seminar in sociology for me and my radical high school posse. We met, as I recall, twice a week in the backyard of the Berkeley stucco home at 2917 Ashby Avenue he was renting with Stew Albert and Stew’s partner, Judy Gumbo. We read our way through a daunting stack of books, including C. Wright Mills’s The Power Elite. I was enthralled by how Tom led our discussions, often taking a Socratic approach, asking questions, prompting us to delve deeper and think more rigorously and never to check our critical faculties at the title page. He had the habit of letting everyone in the group have their say and then, at the end, succinctly and often, as it seemed to me, brilliantly summarizing the various views. Even better, he had the knack of being able to tease out of apparently contending and contradictory positions a path forward that might braid together the salient aspects of different ideas while enrolling them in a more coherent and plausible synthesis. I saw him do this at countless meetings to chart political strategy in Berkeley. This talent was perhaps rooted in his Catholic upbringing and Jesuitical turn of mind. He had a way of breaking down complex arguments, often offering up an analytical taxonomy that almost always had three components, out of which he’d forge some more compelling approach. And it was all delivered in a voice that evinced the deliberate, rather flat affect of his Midwestern origins. A southpaw, he held his ubiquitous coffee mug in a wraparound embrace which, for reasons that elude me, was utterly captivating. His critics suspected that beneath the apparently objective delivery was a hidden agenda whose aims were almost never publicly disclosed. Some regarded Tom’s supple political turn of mind and gift for adroit and deft navigation of the currents of sectarian squabbles as evidence of a Machiavellian temperament and, what was worse, the sort of careerist ambitions and lust for power that was condemned as the unexamined birthright of the alpha male. Tom, for his part, after surviving the Procrustean suffocations of Berkeley in the late 1960s and early ’70s, found himself expelled by his former comrades and forced into a kind of internal exile in Venice, California. He would ultimately shed the provincial precincts of political correctness for a return to the politics of coalition, a politics that wouldn’t permit a purity of principle to subvert a more pragmatic, if messier, pursuit of real-life change. For all his idealism, Hayden never wanted to live in a world of delusion. He had a more unsentimental view of the obligations of making history. Tom’s half-decade in Berkeley coincided with a growing intoxication with ideology and a mounting sense that apocalypse was at hand. With Nixon triumphant and the Vietnam War continuing, some in their despair grew desperate. Tom was not immune to such feelings. Berkeley in those years contained less a politics than a collection of seductive moral sympathies. A taste for extremism was shared by almost everyone we knew. My high school mates cut each other with knives in order to practice sewing up the wounds we were sure would be inflicted upon us as we mounted the barricades. We went to nearby rifle ranges to practice with the M-1 carbines and shotguns we thought we would need to defend ourselves against the savageries of the nation’s police and agents provocateurs. I remember vividly the day Neil Armstrong landed on the moon. I had accompanied Tom and Stew Albert to the United Front Against Fascism Conference in Oakland that had been chiefly organized by the Black Panther Party. Afterward, we repaired to the Ashby house to watch the historic landing. While Walter Cronkite was nearly overcome narrating the descent, Stew smoked a joint, Tom steadily drank cheap red wine, and I spotted in an open closet door Stew’s .30-06 rifle. Ultimately, Tom, though tormented by the way some of his compatriots had helped fuel the fires of fanaticism, would embrace a steadier politics of reform, based on a thoroughgoing sense that real change comes from grassroots activism combined with persistent efforts to win concessions from within the citadels of power. His years as an elected state legislator, while simultaneously seeking to arouse disaffected citizens to organize on behalf of their own—and others’—interests, would put paid to the canard that he was a bomb-throwing revolutionary. In truth, Tom was an exemplary reformer, ever stalwart, in the best American tradition. He drew strength from the battle to make history. The destination was important, of course, but truly the journey was the crucible that forged character. Birthing the new was always at the heart of his love of life. When my daughter, Mira, was born, Tom and his wife, Barbara, made a gift to us of the crib their son Liam had once used and a pillow bearing the likeness of Alice in Wonderland, as drawn by the great Sir John Tenniel. It was as if Tom had said that the point of it all was to turn yourself inside out and see the world with new eyes.